The owners of MidnightBox are located in Depew, NY and sold their very first item on the site on May 23, 2005. The site runs a total of six deals each day. The deals consist of a wide variety of items and can range from computer peripherals, video game items, cameras and accessories, electronics, housewares, watches and more. 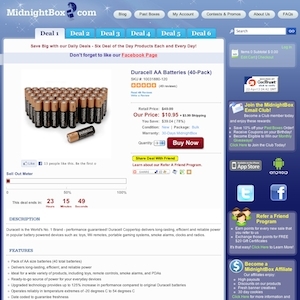 Midnightbox.com currently ranks #111 amongst sites offering online deals -- StumpsParty ranks #110. In the General Merchandise category, MidnightBox ranks at #36 -- Taylor Gifts ranks #35. Amongst all deal a day sites, MidnightBox ranks #17 -- That Daily Deal ranks #16.